17th Century Dutch Realist Landscape Painter, Dordrecht School. The Dutch landscape painter Aelbert Jacobsz Cuyp (or Cuijp) was one of the foremost landscape artists in 17th century Dutch painting (1600-80). His finest landscape paintings - riverscapes and scenic views with placid livestock are characterized by great serenity and masterful handling of glowing light in an Italianate style - a style he took from Claude Lorrain and other classical painters. Popular in Holland, he was also highly appreciated by many English art collectors, and influenced the English School of landscape painting. In newly independent Protestant Holland of the 17th century, painters, searching for new subject-matter to replace the old devotional subjects, turned their attention to landscape, and a school of Dutch Realism emerged whose artists included (in addition to Cuyp) Meindert Hobbema (1638-1709), Salomon van Ruysdael (1603-70) and Jacob Van Ruisdael, whose work helped to form the conventional English taste in the next century. However artists divided into two competing camps or styles. The first continued the classical tradition popularized by Claude Lorrain. Classical landscapes were ideal-landscapes, often depicting scenes of the Italian countryside, real or imagined. Mythological narrative was also included. In comparison, the native Dutch Realist style was taken directly from nature, which was reproduced with great fidelity. In Cuyp's time, the former style was more appreciated by patrons among the Dutch bourgeoisie. Utrecht School of Dutch Realism. Interiors, genre works, still lifes. Still life painter from Antwerp. Painter of the Utrecht school. Noted for his tavern genre-pictures. Peasant scene artist, from Haarlem. the Baroque Dutch Golden Age. Aelbert Cuyp was born in Dordrecht, into a family of painters and stained lass artists, and trained under his father Jacob Gerritsz Cuyp who was proficient in both landscape and portraiture. Early works such as his Landscape with Cattle (1639; Musee des Beaux-Arts, Besancon) may reflect his father's style. For a time he painted landscapes in the tonal manner of Jan van Goyen (1596-1656); but by the early 1640s Cuyp's style began to reflect the influence of those artists, such as Jan Both (1618-52), whose vision of landscape had been formed by travel in Italy. Cuyp is best known for his river scenes and seascapes in which the moist atmosphere bathed in soft golden light lends an Arcadian quality to his work. This golden light often catches just the edges and rims of vegetation, clouds or animals, with highlights laid on in thick impasto paint. The mood of his pictures is generally calm and silent and there is a degree of generalization in his rendering of specific localities; the View of Nijmegen (Indianapolis Museum of Art) is an example of this. By these means, Cuyp turned his native Dordrecht into a dream world captured at the start or end of a perfect day, with an all-pervading sense of stillness and security, and everything in harmony with Nature. As his drawing skills testify, Cuyp was an excellent sketcher. Surviving examples of his daughtsmanship include light-drenched ink washes of golden brown showing distant views of Dordrecht or Utrecht, typically not finished compositions but merely working references for his studio paintings. 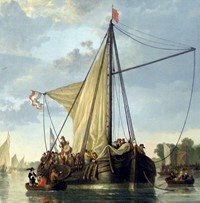 There is no documentary evidence that he ever left Dordrecht, but certain paintings and drawings suggest that he travelled to Utrecht and along the Rhine. In 1658 he married Cornelia Boschman, a wealthy widow, becoming a member of the wealthy merchant class of Dordrecht in the process, after which he purchased a country estate and generally neglected his art for local politics. Or, as other art historians maintain, he acquired a degree of financial security that enabled him to give up painting in the later years of his life. At any rate he also became active in religious affairs, as deacon and elder of the Reformed Church, and was a member of the Dutch High Court. Although Cuyp signed many of his paintings, few are dated, thus the true extent of his oeuvre is uncertain. For example, a huge number of pictures are ascribed to him, including a number which were probably painted by his contemporaries, notably Abraham Calraet (16421722), whose initials A.C. are the same as Cuyp's. Cuyp had little influence on painters outside Dordrecht, but in due course he became a favourite of collectors, especially in England, where some of his finest works remain. For more than fifty years after his death Cuyp was virtually forgotten. Then, as interest in landscape painting among English landowners (and artists) began to rise during the late 18th century, with the emergence of the English School of landscape painting - exemplified by the likes of Richard Wilson (1714-82), Samuel Scott (1710-72), Charles Brooking (1713-59) and Thomas Gainsborough (1727-88) - Cuyp's landscape painting was revived and his reputation rose accordingly. This also led to a surge in buyers for his Italianate style of outdoor views. He is now considered to be one of the finest Old Masters of the Dutch Realism School. - Sunset After Rain (1648-52) Fitzwilliam Museum, Cambridge. - A Distant View of Dordrecht with Milkmaid & Cows (1650) National, London. - Herdsman and Five Cows by a River (1650) National Gallery, London.  For biographies of celebrated artists, see: Famous Painters.